On April 12, the voters of Edgar town will decide whether to follow the advice of the town board of health on a very important issue. The board of health has voted 2-0, with one abstention, in favor of adding fluoride to the community water supply. A small but vocal group of residents has opposed this measure. The question will appear on the annual election ballot. Why do the overwhelming majority of physicians and dentists on Martha’s Vineyard and throughout the United States support community water fluoridation? Why does the Centers for Disease Control and Prevention of the U. S. Public Health Service advocate for community water fluoridation? Why do more than 100 national and international health service and professional organizations working to solve the world’s health problems — from the Alzheimer’s Association to the World Health Organization — recognize and support the benefits of community water fluoridation? There are only two answers to these questions: First, over fluoridation’s 70 years of use, it is proven safe by the overwhelming weight of credible scientific evidence. Second, fluoridation is the single most effective public health measure known to decrease the number and severity of cavities in the teeth of children and adults. As a result, nearly 75 per cent of the US population now benefits from community water fluoridation. Safe means safe. Despite the fear mongering on the internet, fluoride, added correctly at the rate of 0.7 part fluoride per every one million parts of water, is safe. This amount is equivalent to one inch in 23 miles. As in other matters these days, repeating fictions over and over does not make them facts, as the critics of water fluoridation would like you to believe. The proven safety and benefits of community water fluoridation are based on the best available scientific knowledge resulting from the efforts of nationally recognized scientists who have conducted research, using the scientific method, drawn appropriate balanced conclusions based on their findings and published their research in refereed professional journals that are widely held or circulated. Those published studies have been confirmed by nationally and internationally recognized scientific investigators. The vast and overwhelming majority of those studies have deemed community water fluoridation safe and effective. Despite the abundance of extremely valuable homes in Edgartown, the Martha’s Vineyard Hospital dental clinic has a waiting list of about two years including many Edgartown year-round residents. In addition, 43 per cent of the students at the Edgartown School are eligible for free or reduced cost lunch and breakfast, an indication that they and their family members experience difficulty paying for and accessing regular dental care. Preventing the need for dental repair as much as possible through fluoridation, a safe, proven public health measure, makes good sense. As a pediatric dentist practicing here on Martha’s Vineyard for the past 10 years, and for nearly 40 years before that in New York, Dr. Bruce Golden has met countless families faced with the burden of dental disease. As essentially everyone knows, cavities, or tooth decay — or to use the scientific name, dental caries — cause discomfort and even outright pain and swelling and disability. This is an illness that cannot be corrected with a pill. It is difficult and time consuming and expensive to treat. Small children with extensive dental caries may need sedation or even general anesthesia to manage their anxiety. As hard as dentists try to make it as pleasant as possible, it often is not pleasant at all. Frequently, Dr. Golden meets with families with children needing extensive dental treatment. The child may be quite fearful. The parents may also be fearful for their child, and often they have a sense of guilt that they should have been able to prevent this problem if they had only known how. It is heartbreaking to need to explain to parents that their child has extensive dental disease and must cope with multiple treatment sessions. An important fact about dental disease is that it is not distributed evenly in a community. Public health research confirms that it strikes to a much greater extent in the most vulnerable and least affluent families. This is the very definition of heath care disparity: a difference in the occurrence of a particular affliction linked to social and economic disadvantage, which is historically tied to discrimination and exclusion. 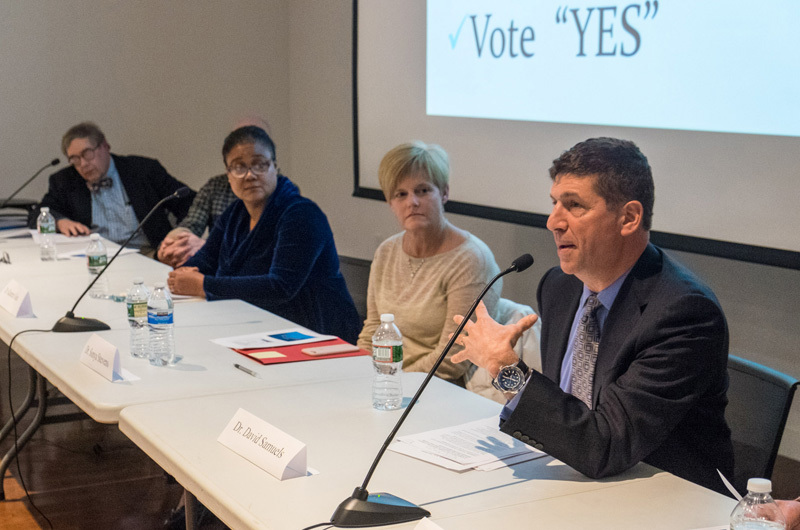 At the community forum on fluoridation offered by the Edgartown board of health on March 8, 2018, Dr. David Samuels noted that when a friend, loved one or family member is diagnosed with a serious or chronic illness, advice and care is nearly always sought from the best and most expert health care professionals available. These are the same health care professionals that are nearly unanimous in their unwavering support of community water fluoridation. Their opinion and expertise is important. With these thoughts in mind, I truly hope that the voters in Edgartown will answer the ballot question “Shall the public water supply for domestic use in the town of Edgartown be fluoridated?” with a resounding yes.